Thamrin Plaza is one of the shopping centers located in the city of Medan , North Sumatra. Thamrin Plaza is located at Jalan Thamrin and can be reached from the other gate front gate , namely from Jalan Asia and Burnt Rock Road . Thamrin Plaza is located near the market supply , which is one of the largest markets in Medan . Complete this lucrative market quickly reached completion shopping at Thamrin Plaza . Have a variety of clothing stores , household appliances, food stalls , cosmetics store , shoe store , jewelry store , and others. 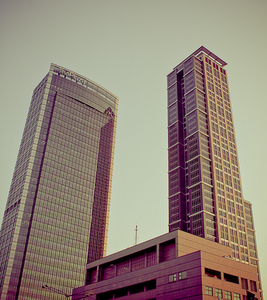 Thamrin Plaza has 7 floors with size . Thamrin Plaza is popular supermarket Sun found on almost every floor . Moreover, on the 7th floor there is also a playground Thamrin 21 and TimeZone . Dining at the mall , among others, McDonald's , Texas , Fountain , Fishermen , d' Loft Food Court , Papa Ron 's , Pizza Hut ( not located within the building Thamrin Plaza , but on the outside ) . Largest food center Plaza is located on the floor 7 Different types of food from the food Indonesian , Japanese , European, Chinese are presented here . Here's the our members favorite photos of "Plazas and Squares in Medan". Upload your photo of Thamrin Plaza! Keliling Aceh is the only Touristlink member to visit Thamrin Plaza. Have you been here? Click here to save it.